You can go through Yael for the pizza offer.... that way you will stay annonymous. Accept the offer! Pesach is very expensive! I know!!! Let your boys fill up on eggs, potatoes, soup, and compote- all are not so expensive. It is very much lunchroom style, but there's plenty food, and all different types of ppl. I am brought to tears every year at the magnitude of this chesed! Wow... that is really something! I hope op takes advantage of this for the next few days!! If I lived in monsey, I probably would! Put up a big pot of fleishige soup every day. Soup made from a $15 piece of pot roast (includes the bone) with water, potatoes, carrots, onions, celery, and any other veggies you like, is filling and tastes great (can add extra soup bones if you have). Get lots of bananas for snacks. Our Rav said the almond flour at Costco (sold without KLP certification) is KLP, and it's much cheaper than other options. pm.me.if youre comfortable, I know the contact person of the person that can possibly provide ready made food. Or if you dont feel comfortable PMing, let me know snd ill send info to Yael. Im just not comfortable sharing a private number to someone publicly. Obviously this doesn't cover chop hamoed outings, cleaning help (though you could cut corners and use $ for cleaning help), or clothes. Keep things simple. It's one week. 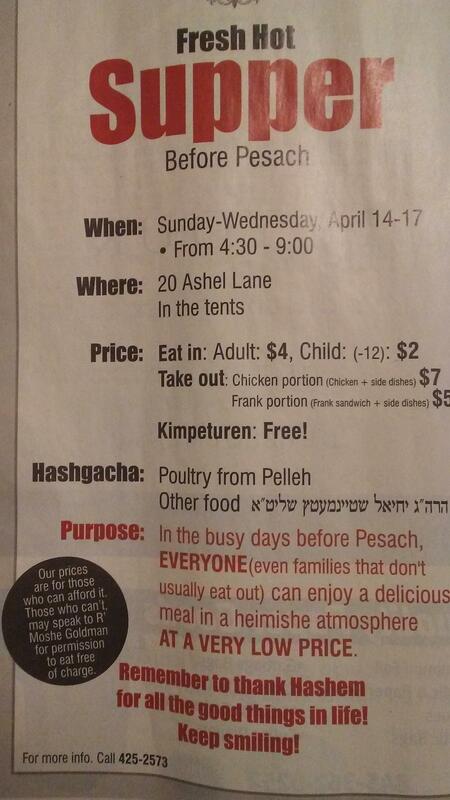 You make Pesach from beginning to end - for 14 people - including teenagers and adult children, for well under $800? That does not sound at all realistic. Or maybe you're just all small eaters. Or maybe you live somewhere with access to much lower prices. I too want to see the $800 breakdown for 14 people. We are $800 plus cleaning help for 4 people. No new clothing, just food. Try vegetarian recipes for weekday. May Hashem provide amply for u and klal yisroel. After pesach Make challah and daaven for parnassa on Fridays when u separate dough. It is an es ratzon for parnassa. Tehillim has also helped Hashem replenish my bank account. Be thankful for what hashem wants YOU to have. This bitachon is keli for more brachos. I'm also getting all my fruit and veggies from a cheap farmers market--saves me 50%!! I agree that in a house with that many people, including teens, that figure seems very low. We’re having 10 people for each seder, and about 6 for all other meals. About $250 including meat, chicken, salmon, eggs, grape juice, seltzer, other ingredients, etc (we’re Chabad and don’t use processed foods so it keeps it down, although I did buy some for kids and the days before Pesach). A bit more than $100 on wine. $100 on matzah (10 pounds shmurah). About $50 (didn’t add it up exactly but something like that) on disposable pans and paper goods. Will probably spend about $80 on produce. About $20 on kitchen covering supplies. Will dry clean my husband’s clothes but not buying any new stuff for me or him (did buy my baby some new clothes but he needed them anyway). I only have an hour of cleaning help a week. This year I didn’t need to buy any appliances or kitchen things but I bought some new Haggadahs and a matzah cover for $140 altogether. Total approximately $700. If I had stuck to the absolute basics I could have kept it to about $500. I could imagine a simple Pesach not being radically more expensive for 18 people - more matzah and wine would be the expensive part. $250 for all the other foods you mentioned also seems cheaper than regular...I want to know where salmon and chicken and all.. for 10 ppl cost that cheap...unless you are rationing very little for each person?? The matzah was actually $11 per pound and I really hope it’s good because yes it’s cheaper than I’ve ever seen. Someone where I live made a bulk order. I don’t ration meat or anything but I don’t cook endless quantities, or expensive options. I do one meat dish per meal, and then lots of cheaper vegetable sides. There’s always tons of food, and leftovers for chol hamoed. 10 pounds of matzo for 14 people seems very little. Even if there's no matzah during Chol hamoed, you still need for 2 sedarim and 6 yt seudos. And $80 for produce? How? If you're stretching. 14 people for 8 days. I've done this. 50 pounds potatoes, 30 pounds onions, 50 pounds carrots, 30 pounds apples, bananas, oranges. That's nothing fancy only cheap produce. But still it adds up. $1/$1.20 per pound.